A robust economy and stock market are invigorating consumers’ wallets. Supported by an even stronger economy south of the border, retail in Canada has maintained its uptrend while digesting disruptive technological change. “Retail has never been in trouble in the last few years,” said business expert Mark Satov, founder of Satov Consultants, in an interview. Retail’s black eyes mainly stemmed from brick and mortar—most notably in the United States—that needed to go through a cleansing of sorts due to overbuilding. 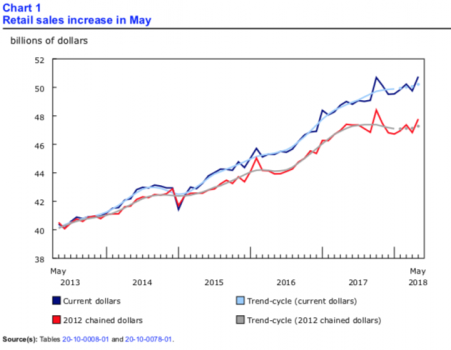 May’s monthly retail sales data, released by Statistics Canada on July 20, firmly put April’s weather-affected disappointment in the rear-view mirror. Some economists upgraded their second-quarter GDP forecasts and the odds rose of another rate hike in 2018. Sales, excluding autos, climbed about three times more than the consensus estimate and total retail sales went up 3.6 percent in the last year. The rise in May came mostly from a 3.7 percent rebound in motor vehicle sales. Sales volumes were up 2 percent. The Canadian consumer is highly leveraged—holding roughly $1.70 of debt for every dollar of disposable income—and still hasn’t seen truly robust wage growth. Nevertheless, consumer spending is clearly ticking along. TD senior economist Brian DePratto noted that retail sales only capture about 20 percent of overall consumer spending. “The fact that consumer spending on cars remains healthy despite rising borrowing costs suggests that the tightening [interest rate hiking] cycle still has lots of room to run,” DePratto said in a note. But the Bank of Canada said in its July monetary policy report that it expects consumer spending to provide less support to GDP in 2018 than it did in 2017. Some of that is due to tighter mortgage rules, but also higher interest rates, which could have a greater impact than ever before due to the high indebtedness of the consumer. The rise in consumer discretionary stocks would also suggest the Canadian consumer is spending—a “wealth effect” could certainly be at hand. Leisure products, apparel, and luxury goods sales are all performing well. In the United States, retail sales for June were up 6.6 percent year-over-year, rising at the fastest clip in over eight years. The S&P 500 retail index is up over 20 percent in the last year and sits near an all-time high. This should bode well for Canada. As for trade tensions, uncertainty over its scope can cause businesses to hold off on projects and consumer confidence to potentially wane. The Conference Board of Canada’s consumer confidence indicator dipped slightly in June. But the current state of the trade war has not taken a toll on the macro-economy. Satov doesn’t think the trade dynamic between Canada and the United States will change dramatically in the end. “Changing the trade dynamic between the U.S. and Canada will not be good for the U.S., just like it won’t be good for Canada,” Satov said. The bigger threat from growing U.S. protectionism is for China rather than Canada, according to Satov. Retail is in a better place in Canada now that the high-profile fiascos of Sears and Target are things of the past. From the mistakes management and ownership have made, the message is clear that business models needed to change. That much is working its way through the industry, but the bottom line is end demand does not seem to be going away. The internet and Amazon effect also are forcing traditional retail business models to transform. The players that are better at “omnichannel”—integrating online and in-store shopping experiences—will survive and do better, said Satov. In-store tech—from smart tags, automated inventory management, and change-room technology—is improving, but its impact is immaterial when compared with disruption created by out-of-store tech. The Bank of Canada’s narrative is that the composition of growth is shifting from consumption (household spending) to business investment and exports. However, consumption and its ongoing contribution from retail could keep playing an important role should the trade war ramp up such that exports and business investment suffer.